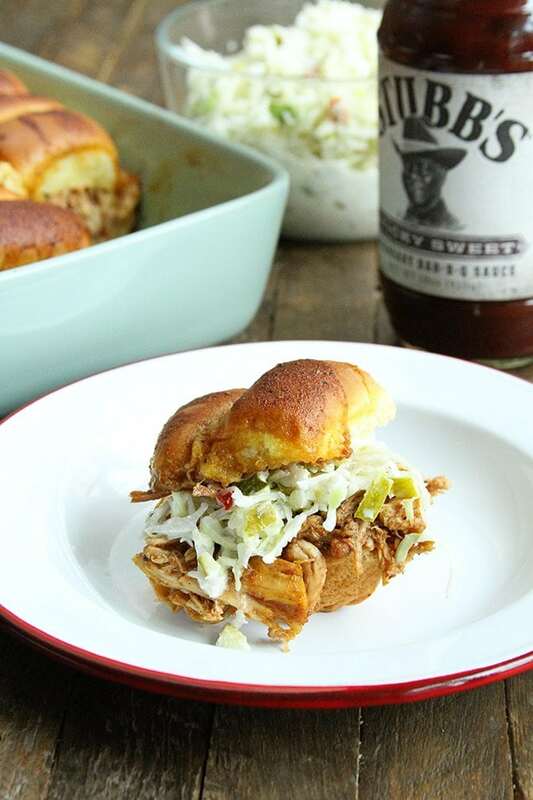 Football season is nearly here and you’re going to need an easy and impressive recipe to show off to your tailgating pals. Well, do I have one for you! 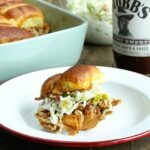 My friends at Stubb’s Bar-B-Q and I teamed up to bring you these AMAZING BBQ Chicken Pull-Apart Sliders with Dill Pickle Slaw. And while the ingredient list might seem a little long, these sliders are super easy to put together. They just take a few steps and I’ve included as much detail as possible. Since the chicken is cooked in the slow cooker, it makes it even easier. What sets these apart is the delicious sauce that you pour over them before you bake them. It’s kicked up a notch with the addition of Stubb’s Barb-B-Q Spice Rub to add even more flavor. It’s the same rub that was crafted by C.B. “Stubb” Stubblefield himself at his original Texas Bar-B-Q joint—a perfect blend of sea salt, paprika and black pepper. And don’t get me started on the Dill Pickle Slaw. I absolutely love dill pickles, so this was a no-brainer. In fact, as a kid I would get in trouble for drinking the dill pickle juice right out of the jar. I hear lots of folks drinking it for health benefits, like muscle cramps, but I just love the taste. Well, this slaw has some serious dill pickle taste! I just love it! 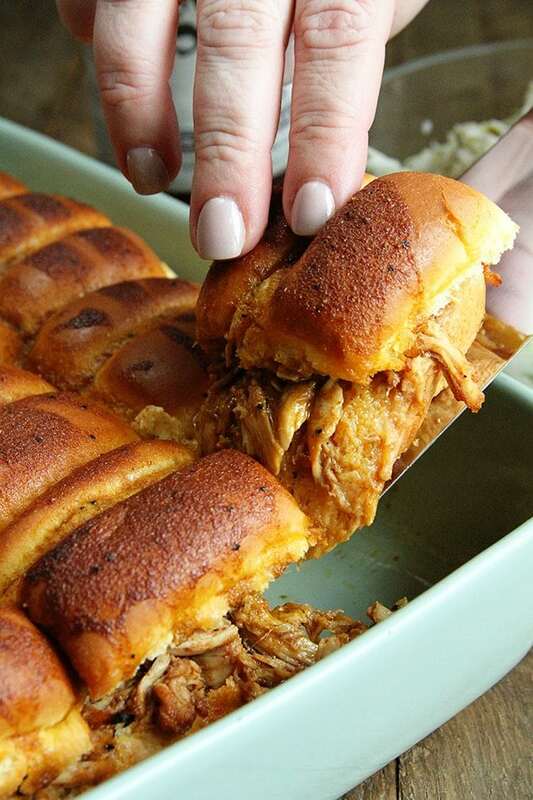 Whip these sandwiches up for your next pigskin party or just a casual dinner and your family and friends will declare you the winner. I promise! Y’all enjoy! 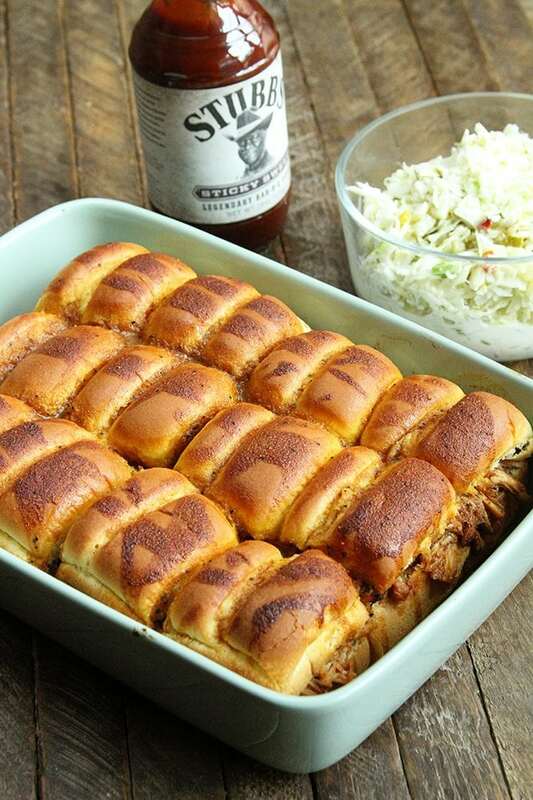 Pour a couple tablespoons of the bar-b-q sauce into the bottom of the slow cooker. Place the chicken on top, then pour the remaining sauce over the chicken. Cover and cook on low for about 4 hours. Once the chicken is done, remove from the slow cooker. Allow to cool enough to handle, then shred. Return the meat to the slow cooker and mix with the juices. Preheat the oven to 350°F and lightly spray a baking dish with nonstick cooking spray. Slice the entire loaf of rolls in half horizontally. 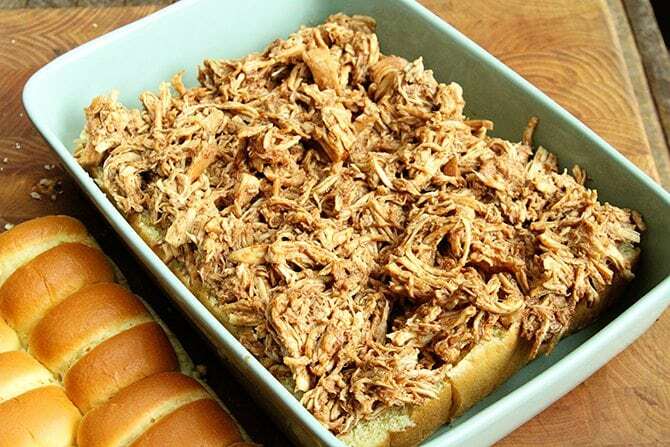 Place the bottom half in the baking dish then place the shredded chicken on top. Then add the top half of the rolls. 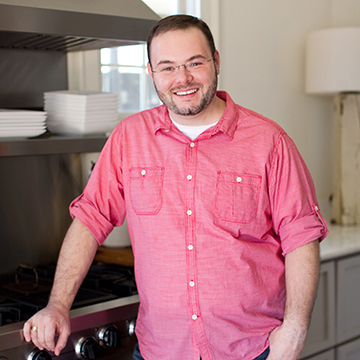 Make the sauce by combining the melted butter, bar-b-q spice rub, Worcestershire, sugar, and mustard in a small bowl. Pour the sauce over the sandwiches. Bake immediately or allow to marinate for no more than 24 hours (covered in the fridge). Bake uncovered for 15 to 20 minutes or until the tops of the rolls are a deep golden brown. While the sandwiches bake, make the slaw by combining the slaw mix and pickles in a large bowl. Make the dressing by combining the mayo, pickle juice, sugar, salt, and garlic powder in a small bowl. Pour it over the slaw, mix well, and refrigerate. This is a sponsored post written by me on behalf of Stubb’s Legendary Bar-B-Q. All opinions are entirely my own. Looks delicious! 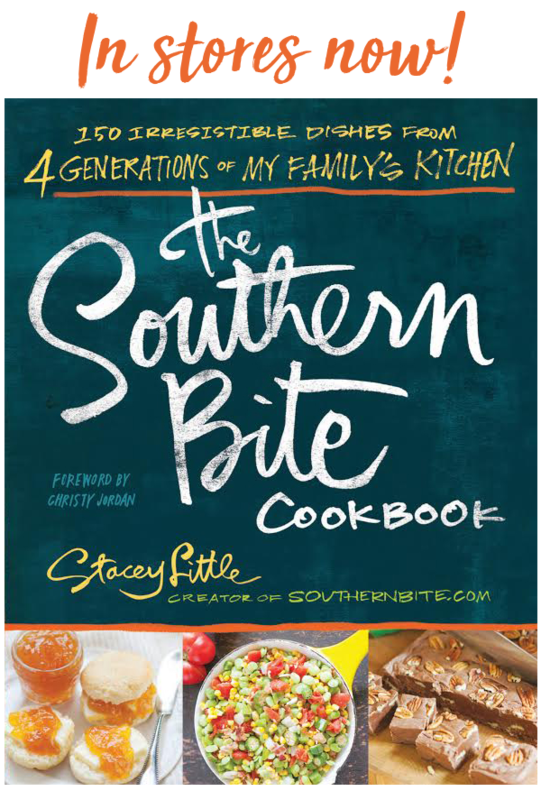 Can’t wait to try these for game day get-togethers! Sure your your gang will enjoy! Boy that looks good. sharing. What a quick and easy cooking idea! One of my favorite things. Thanks for sharing! 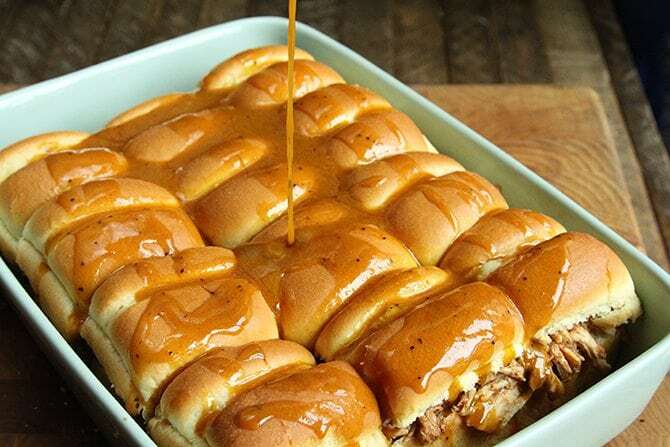 These sliders are sinfully good. We live in Austin and barbecue is taken very seriously here. I was intrigued when I saw that the recipe was one of yours. (I’m a fan.) 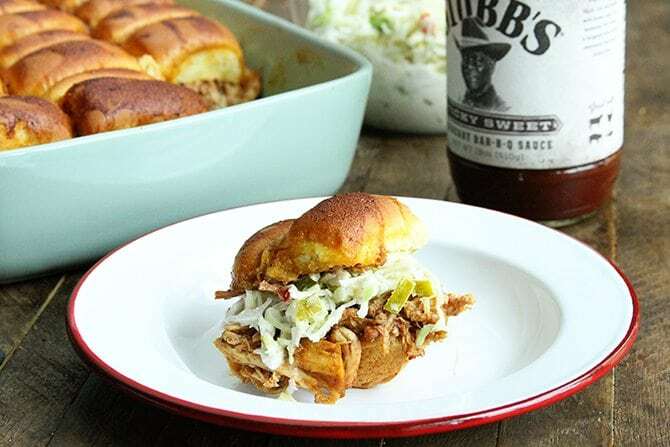 When I saw that Stubbs barbecue sauce was part of the recipe, I was sold. These were so easy to make and my family devoured them! Thank you so much for posting this. I’m not sure I could have hoped for a better endorsement, Lisa! So glad y’all enjoyed these!